What is a protein? Proteins are the workhorses in every cell of every living thing. Your body is made up of trillions of cells, of all different kinds: muscle cells, brain cells, blood cells, and more. Inside those cells, proteins are allowing your body to do what it does: break down food to power your muscles, send signals through your brain that control the body, and transport nutrients through your blood. Proteins come in thousands of different varieties, but they all have a lot in common. For instance, they're made of the same stuff: every protein consists of a long chain of joined-together amino acids. What are amino acids? Amino acids are small molecules made up of atoms of carbon, oxygen, nitrogen, sulfur, and hydrogen. To make a protein, the amino acids are joined in an unbranched chain, like a line of people holding hands. Just as the line of people has their legs and feet "hanging" off the chain, each amino acid has a small group of atoms (called a sidechain) sticking off the main chain (backbone) that connects them all together. There are 20 different kinds of amino acids, which differ from one another based on what atoms are in their sidechains. These 20 amino acids fall into different groups based on their chemical properties: acidic or alkaline, hydrophilic (water-loving) or hydrophobic (greasy). What shape will a protein fold into? Even though proteins are just a long chain of amino acids, they don't like to stay stretched out in a straight line. The protein folds up to make a compact blob, but as it does, it keeps some amino acids near the center of the blob, and others outside; and it keeps some pairs of amino acids close together and others far apart. Every kind of protein folds up into a very specific shape -- the same shape every time. Most proteins do this all by themselves, although some need extra help to fold into the right shape. The unique shape of a particular protein is the most stable state it can adopt. Picture a ball at the top of a hill -- the ball will always roll down to the bottom. If you try to put the ball back on top it will still roll down to the bottom of the hill because that is where it is most stable. Why is shape important? This structure specifies the function of the protein. For example, a protein that breaks down glucose so the cell can use the energy stored in the sugar will have a shape that recognizes the glucose and binds to it (like a lock and key) and chemically reactive amino acids that will react with the glucose and break it down to release the energy. Photosystem I is a collection of proteins in plants that captures sunlight for photosynthesis. Luciferase catalyzes the chemical reaction that makes fireflies glow. Hemagglutinin helps the influenza virus invade our cells. You can find more information on the rules of protein folding in our FAQ. What big problems is this game tackling? Protein structure prediction: As described above, knowing the structure of a protein is key to understanding how it works and to targeting it with drugs. A small protein can consist of 100 amino acids, while some human proteins can be huge (1000 amino acids). The number of different ways even a small protein can fold is astronomical because there are so many degrees of freedom. Figuring out which of the many, many possible structures is the best one is regarded as one of the hardest problems in biology today and current methods take a lot of money and time, even for computers. 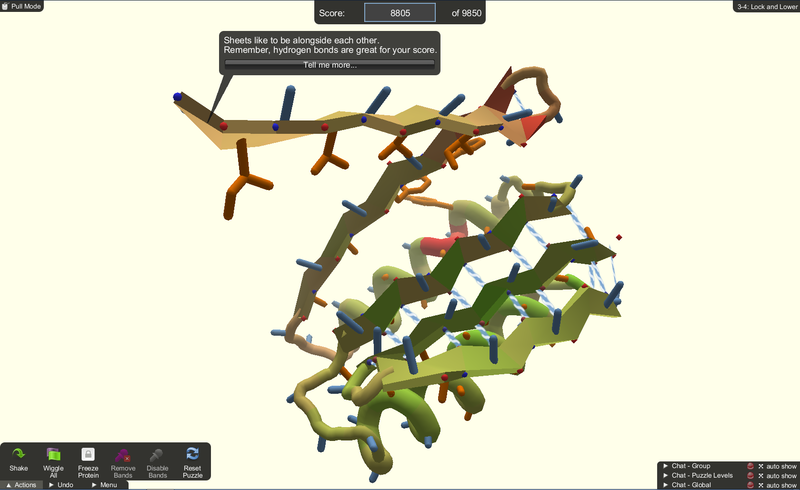 Foldit attempts to predict the structure of a protein by taking advantage of humans' puzzle-solving intuitions and having people play competitively to fold the best proteins. Protein design: Since proteins are part of so many diseases, they can also be part of the cure. Players can design brand new proteins that could help prevent or treat important diseases. With all the things proteins do to keep our bodies functioning and healthy, they can be involved in disease in many different ways. The more we know about how certain proteins fold, the better new proteins we can design to combat the disease-related proteins and cure the diseases. Below, we list three diseases that represent different ways that proteins can be involved in disease. HIV / AIDS: The HIV virus is made up largely of proteins, and once inside a cell it creates other proteins to help itself reproduce. HIV-1 protease and reverse transcriptase are two proteins made by the HIV virus that help it infect the body and replicate itself. HIV-1 protease cuts the "polyprotein" made by the replicating virus into the functional pieces it needs. Reverse transcriptase converts HIV's genes from RNA into a form its host understands, DNA. Both proteins are critical for the virus to replicate inside the body, and both are targeted by anti-HIV drugs. This is an example of a disease producing proteins that do not occur naturally in the body to help it attack our cells. Cancer: Cancer is very different from HIV in that it's usually our own proteins to blame, instead of proteins from an outside invader. Cancer arises from the uncontrolled growth of cells in some part of our bodies, such as the lung, breast, or skin. Ordinarily, there are systems of proteins that limit cell growth, but they may be damaged by things like UV rays from the sun or chemicals from cigarette smoke. But other proteins, like p53 tumor suppressor, normally recognize the damage and stop the cell from becoming cancerous -- unless they too are damaged. In fact, damage to the gene for p53 occurs in about half of human cancers (together with damage to various other genes). Alzheimer's: In some ways, Alzheimer's is the disease most directly caused by proteins. A protein called amyloid-beta precursor protein is a normal part of healthy, functioning nerve cells in the brain. But to do its job, it gets cut into two pieces, leaving behind a little scrap from the middle -- amyloid-beta peptide. Many copies of this peptide (short protein segment) can come together to form clumps of protein in the brain. Although many things about Alzheimer's are still not understood, it is thought that these clumps of protein are a major part of the disease. What other good stuff am I contributing to by playing? Proteins are found in all living things, including plants. Certain types of plants are grown and converted to biofuel, but the conversion process is not as fast and efficient as it could be. A critical step in turning plants into fuel is breaking down the plant material, which is currently done by microbial enzymes (proteins) called "cellulases". Perhaps we can find new proteins to do it better. We’re collecting data to find out if humans' pattern-recognition and puzzle-solving abilities make them more efficient than existing computer programs at pattern-folding tasks. If this turns out to be true, we can then teach human strategies to computers and fold proteins faster than ever! You can find more information about the goals of the project in our FAQ. Foldit has been in dozens of publications over the years - to list them all would take a page of their own. For a sampling, please see our Center for Game Science page. Check out the Rosetta@Home Screensaver to see how computers fold proteins using distributed computing. Rules for Foldit community members can be found here. You can listen to all episodes of the Let's Foldit podcast here. Thank you for using Foldit in your classroom! We have put together a set of instructions to assist you in setting up your students to play Foldit. The Foldit terms of service and consent can be found here. You can find the researchers and supporters associated with this study on the game's credits page.